Best Speakers For Harley Street Glide Reviews: Top-5 in April 2019! Speakers for Harley Street Glide – Buyer’s Guide! Why does your Harley stereo system sound bad? Good question. Speaker quality and lack of power at speed are the first thoughts that come to mind. Poor SQ or lost signal going down the road, bass loss at speed with all that engine / wind / road noise is making it even worse. Low efficiency, weak factory head unit, constantly hot amp that keeps shutting down… Who needs that? 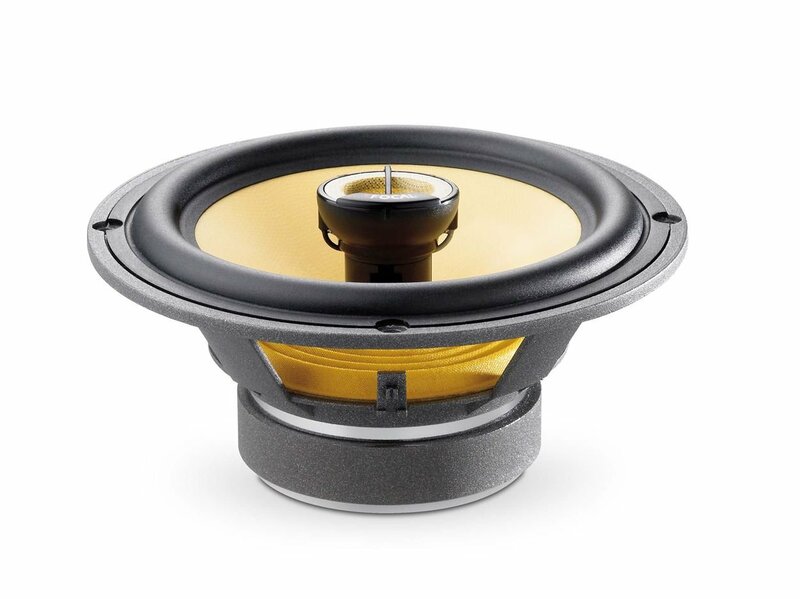 Another issue is that factory speakers are 2ohm and most aftermarket are 4ohm. Also, on most 2way aftermarket speakers, the center mounted tweeter sets too high and hits the factory speaker grille. The thing is that a manufacturer looks over every single part of a vehicle with a cost in mind because saving a few bucks here and there adds up to lots of money when you sell thousands of vehicles. Unfortunately, it’s your sound system that pays the price. Harley speakers, in fact, were not designed to sound great. True story. They were just a means to an end. When you’re at a standstill that may be fine. But is that supposed to be enough? You don’t want to just listen to the music with your engine off, right? And you don’t need some noisy speakers just because they’re loud at speed. This means you need quality, so here comes the aftermarket. Fortunately, there’s always a room for an upgrade to make the sound of your bike exceptionally good with a set of great-quality speakers and/or an amp while keeping the stock look. Find the benefits of top 5 speakers to find the best solution for your bike from the list below. Reliable protection against vibration, rain, and moisture. Simple controls (switching functions, track selection, volume control). The ability to connect other devices. Additional functions (FM-radio stations / external sources availability). In some models, the amplifier is already built in, which greatly simplifies the process of installation and configuration. How to Choose Harley Speakers? A clear, crisp sound that sparkles in the mid-range audio spectrum. Great mids and highs. 55 watts of range encapsulate 2-way sound with the help of a swivel tweeter which turns up to 10 degrees during tuning. Soft silk diaphragm with hard aluminum gives high resolution and broadband signal. High-tech looks and ultra-light HD polymer frames for improved sound quality, higher efficiency and high power handling. Work well off the lower power of most factory systems. Perfect addition for almost any OE system upgrade. These babies really put out and blow away other mid-range speakers. They are extremely versatile and great sounding speakers which makes them an amazing addition for any OE system upgrade. The richly satisfying sound can be achieved without a subwoofer. And if you add an amp to them, that’s a night and day difference. Replace your existing sound system with a new model that gives you plenty of new musical choices. These popular Type-S family sleek coaxial speakers are amazing for upgrading your sound system or working with an aftermarket stereo. Their ultra-light HD polymer frames represent improved sound quality and impressive tone definition. The silk dome tweeters provide smooth highs without hurting your ears during a long drive (especially when powered by an external amplifier). 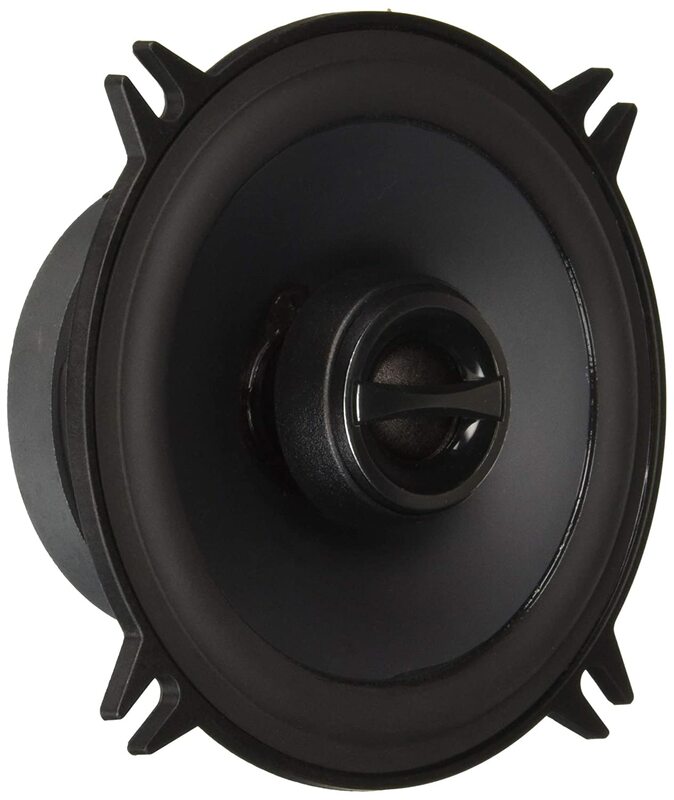 Tough butyl rubber surrounds help retain the woofer centered for accurate cone movement, cutting down distortion. Their cones are mineral-fortified polypropylene which means they’re exceptionally stiff, yet lightweight delivering pure midrange. You will have sound quality and volume enough to create a concert on two wheels! Excellent 80 watts RMS power handling. Outboard crossover with adjustable tweeter level control. Aramid fiber layer on top of a woven glass layer. Another coaxial smooth design and accurate speaker that delivers incredible midrange clarity. It’s effective and flexible and can excel with an adequately powered amplifier to reproduce the full dynamic range and details of music you listen to, thanks to excellent 80 watts RMS power handling and tight bass punch. Also, the K2 composite sandwich cone allows this speaker to achieve detailed audio output and high power handling. The focal 165KRC speaker is a perfectly sized 6.5-inch full-range loudspeaker producing crystal clear sound (4 Ohm impedance). It has extraordinary drivers and lets you enjoy selected tracks with outstanding focused sound quality. That’s because it features a 2-way external crossover with 3 tweeter levels, 2 tweeter slopes, and 2 midrange level settings. Rated at 120 watts RMS and 240 watts peak power. High-quality glass-reinforced nylon speaker adapters and stainless steel mounting hardware included. No modifications required with this bolt in, plug-in-and-go speaker. The ultimate upgrade at 83% more sound than stock Harley speakers. Free-flow grill design ensures maximum sound transfer. Many say that this one is the best sounding speaker to fit your fairing. They let you hear your music at 70 mph, on a wet road, with a wind in your face. Probably because it was designed by Biketronics from scratch. Crystal clear sound at amazing volume levels without distortion won’t leave you indifferent. And it’s capable of handling huge power! 92.6 dB, 4 Ohm with a 100 W continuous power (200 W peak power). You can turn them up to the highest level and get great clarity without any fear of crackles or noises. 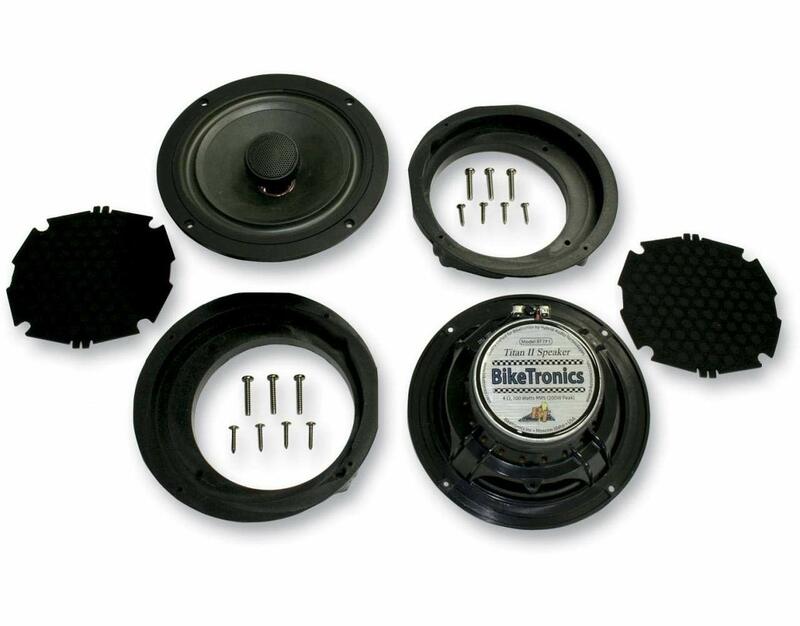 These speakers give 83% increase over Harley stock speakers that provides improved performance. Also, they will work just fine on any system rated for 1, 2, or 4 ohms. You can go higher resistance on a speaker (not lower, though). The large diameter voice coil. Great sensitivity rating of 94dB/W/m. Not scared of ultraviolet light, the corrosive effects of salt fog, and temperature extremes from -40° F to 185°F. Futuristic design with the honeycomb texture. An impressive triple-digit nominal power rating. Best power/value per dollar deal we’ve found so far with marine speakers. These full-range speakers offer serious power and potential volume despite being not all that expensive. The manual even warns that high volumes can cause permanent hearing damage. So watch out! They also come with an external crossover that allows you to adjust the tweeter level by 3 dB. 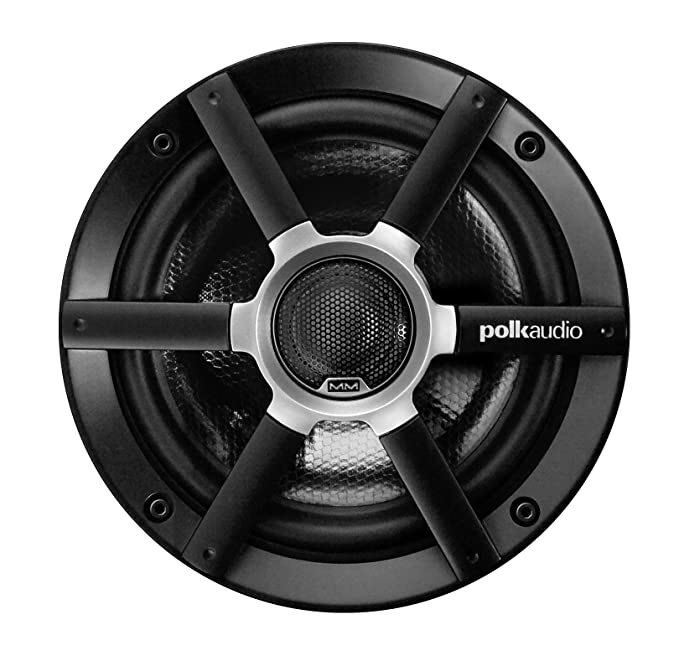 All in all, the Polk MM651 is a marine speaker set for those who really want to blast their music. The Polk MM652 is one of the best marine speakers available because it combines high-fidelity audio with excellent power handling and marine-grade durability. The exceptionally high sensitivity rating of Polk loudspeakers indicates that the magnet is very strong and the cone is light and stiff. Both of these traits are very good things for sound quality. Direct connect wiring harnesses for Harley-Davidson models. The kits fit factory attachment points. No cutting or drilling to keep factory warranty from being affected. Goes with the upgraded four-channel efficient amplifier. You thought you had a great sound system. This kit is designed to impress and make people change their mind about great SQ. 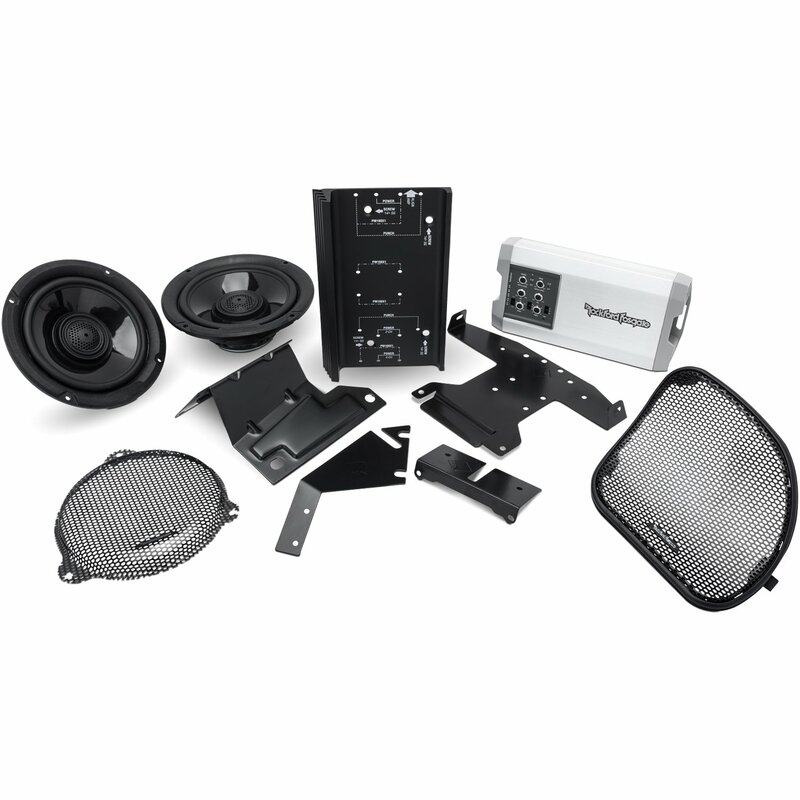 Rockford Fosgate kit speakers are weather-resistant and can handle whatever the road and exposure to the elements may bring. This will add stunning audio performance to your bike and it’s an absolute bang for the buck! The neodymium magnet keeps it small enough to fit, but let it handle a lot more power (requires 400W). The polypropylene cone and film dome tweeter provide a big step up from the factory speakers. Plus there won’t be problems with the installation process since these speakers fit up standard Harley designs perfectly. Decided that you need to buy a sound system for your bike, you should understand the features of acoustics for such a vehicle. Don’t forget about the size. For dynamics especially, size matters. Pay attention to the built-in power. The sound system should be powerful to interrupt the roaring sound of the engine + absolutely hermetic. Make sure that the controller is located in a convenient place. Most modern audio equipment can reproduce all common audio formats and radio stations. Make sure that fastenings are reliable and all mounts are fixed. Make sure the body material is resistant to corrosion / abrasion / moisture and does not fade in the sun. The audio intensity of the audio system should be at a very low level. Otherwise, after a noisy disco in the wilderness, you risk simply not starting your bike. Sound system must withstand overloads and shakes, be resistant to strong vibrations and harsh weather conditions. Otherwise, it will be enough for a couple of trips in good weather. Dust, water, and dirt will spoil even the best sound. And in the end, the system simply stops working. It will be extremely difficult to restore it. It is also worth paying attention to possible noises and crackling when checking your speakers. To achieve high-quality sound from audio systems on such a vehicle can be quite difficult sometimes. Set of tools for high-quality system installation. The most common coaxial speakers’ options go with three heads: for bass, midrange and high frequencies. The advantages are a compact and extended range. In fact, 3 loudspeakers are installed in the same place, which makes a more powerful and richer sound. For clearer surrounding sound, you can always add a sub, which will also make a better bass. Rear Shocks for Harley Davidson Touring – Buyer’s Guide! Hidden Antennas for Harley Davidson – Buyer’s Guide! Tuners for Harley 103 – Guide For Harley’s Owners! Oil for YZ250F – Buyer’s Guide!